Long ago, before India, before China, before Will and all of the hundreds of photos of him, this space used to be something of a food blog, a place for me to post photos and recipes from the our kitchen in Washington, DC. I cook and bake more than ever now, including at least 2-3 loaves of bread each week, but at some point, I stopped being so religious about photographing our food before we eat it. And what good would a food blog be without great recipes and as gorgeous food photography as the one’s on this blog to oggle over? It wouldn’t be. To whit: I actually started drafting this post back in January and I’ve made at least a dozen batches of these cookies since then. This past week is the first time they’ve ever been photographed. This may not be a real food blog anymore, but these cookies just too good not to share. They are my secret weapon in the quiet little world of coffee socials and play-dates that we inhabit when we aren’t out exploring historic Delhi. 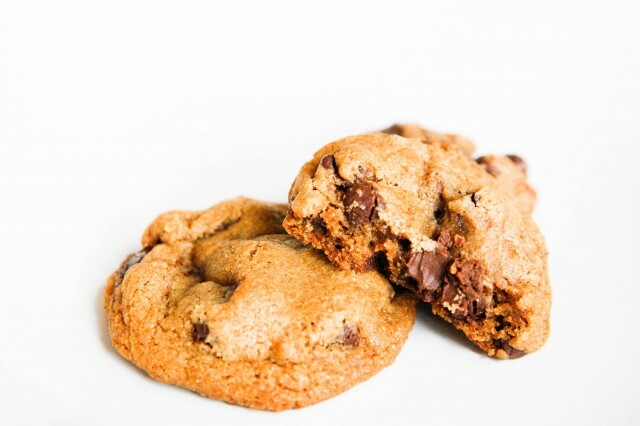 I’ve harbored an obsession with finding the world’s greatest chocolate chip cookie recipe since I was about 12 years old, and over the years I’ve tried many recipes. I’ve used the super-secret Nestle Toll-Ause recipe, I’ve tinkered with salt and vanilla levels. I tried the New York Times best chocolate chip cookie recipe, I’ve tried bread flour, cake flour, 1 egg, two eggs, extra yolks, finicky mixing methods, letting the dough “rest and mature” in the fridge, you name it, I’ve tried it. I thought I had the perfect recipe until last winter when my mother sent me a photocopy of a Cook’s Illustrated recipe that she had recently tried. The brown butter called for in the recipe was an inspired twist on the usual creamed-versus-melted debate. It added a certain toasty depth and changed the texture a bit, but I couldn’t just leave the recipe as is. I tinkered, and in doing so, I think I may have stumbled upon my best recipe yet. These cookies aren’t like those super-chewy frisbee-sized cookie disks from the deli that look so good but taste of nothing but sugar and lard. These are not Chips Ahoy style cookies. These aren’t even your Mom’s cookies. These cookies are crispy around the edges, a bit chewy towards the middle, and finally soft and gooey in the center. Though they have no more butter or sugar or eggs in them than most recipes, they taste richer. The flavors are complex and a little striking for such a humble little cookie. They remind me of caramel and toffee, though the recipe calls for neither of these things. They are slightly saltier than your average cookie–and that’s always a good thing in my book. The following recipe is essentially a mash-up of the New York Times and the Cook’s Illustrated recipes with a few additions and changes. I’ve outlined some of these changes in the hilariously detailed paragraphs below. Though its probably way too much reading for one simple little recipe, I promise the cookies you will get out of it in the end will be worth your while. This may go against everything you’ve ever heard about baking but I actually prefer baking with salted butter. I find plain white sugar to be fairly tasteless on it’s own. Add a pinch of salt and all of a sudden you’ve got real flavor. For this recipe I usually use the amount of salt called for plus salted butter plus perhaps an extra pinch if necessary. Land o’ Lakes butter is usually pretty lightly salted. The French butter I’m using here is downright salty and requires that I dial back a bit on any extra salt. Brown butter smells like toffee and toasted nuts. It’s rich, it’s dark, it’s nutty. It is completely the opposite of everything you believe butter to be. Butter browns slowly until the the point right before it burns–then it goes very fast. Use a white-enamel lined pot or a light-colored pan when browning the butter and when you see it start to go tan, start watching more closely. Don’t take it off too soon though. Wait until you can really smell the toasted notes and until the butter and solids are a deep brown color. Light brown won’t give you the depth your looking for. If you smell burning, you’ve gone too far, but it’s probably still salvageable if you get it off the heat immediately. Browning the butter in this recipe adds some nice toasty notes to the cookies and I find a touch of almond extract only enhances this really wonderful flavor. Sometimes I use a full 2 teaspoons vanilla plus an extra 1/2-1 teaspoon of almond extract but I think nearly the same flavor can be achieved by simply swapping some of the vanilla for some almond. And while we are on the subject: buy good extracts. They really make a difference. 4. “Old” dough is the tastiest dough. Once you have your finished cookie dough in a bowl, cover it with plastic wrap and let it sit in the fridge for up to 3 days before de-thawing and shaping into cookie balls. This will do more for the flavor of your cookies than anything else. Even if you don’t want to brown your butter. Even if you are totally loyal to your own cookie recipe, just try letting the dough rest in the fridge for a few days before baking and see what you think. I’ve actually experimented with making the cookies immediately, letting the dough chill for 1 hour, 1 day, 2 days and 3 days. I’ve tried freezing in individual cookie dough ball form and letting the dough sit in the fridge as a whole. It’s a bit of a pain, but I find that letting the dough sit in a bowl in the fridge for 3 days gives the cookies a much deeper, more complex level of flavor. It may be the eggs (they say custards are best if the eggs are allowed to sit and meld with the flavors in the fridge overnight) or it may just be that the rest lets all of the extracts and sugars really break down and mop up all of the flour. Either way, it’s amazing. 5. Flash freezing = always having freshly baked cookies in the house. After three days in the fridge, I let my cookie dough come up close to room temperature, I scoop all of the dough into balls (a cookie scoop like this one is priceless) freeze them all briefly on a cookie sheet and then put them in a ziplock bag and store them in the freezer. This way, I never have to make a whole batch of cookies at once unless I want to and so nothing gets wasted and none of the cookies end up sitting on the counter past their prime. Instead, I’ll make 2 or 3 after dinner for dessert for Chris and I or I’ll bake half a dozen if someone stops by for coffee. I try to make sure I always have at least a dozen or two in the freezer at anyone time. That way if some function comes up and I’m too busy to bake, I just throw the whole batch of dough balls in the oven and I’m done! The only dish to wash is the baking sheet. I think freezing cookie dough also helps maintain the “crispy edges, chewy centers” phenomenon even when you are making 35 little cookies instead of 16 big ones like the recipe calls for. (I’d rather have 3 little cookies than 1 big one but that’s just me?) When it’s time to bake, put your frozen cookie dough on a baking sheet and pre-heat the oven. By the time the oven reaches 375 degrees F (190.5 degrees C) the dough will have de thawed just enough to avoid thick, hockey-puck shaped cookies. 6. Don’t over-bake your cookies. The only tricky thing about this recipe is that it’s very easy to ruin them by over-baking them. For some reason, just two minutes too long in the over renders these cookies hard, a little gritty and a bit burnt tasting. So how do you know when to take them out? Set a timer for 10 minutes but also pay attention to their smell. When the kitchen starts to smell delicious, it’s probably time to take them out. As for visuals: I bake these cookies just until the edges look a little browned but the centers still look a little wet. If your worried about taking your cookies out too soon, leave them on the hot baking sheet on top of the stove for a few minutes before moving them to a cooling rack. The residual heat will ensure they are cooked safely through. 1. Combine white and dark brown sugar in a large heatproof bowl and set aside. Combine flour and baking soda in a small bowl and set aside. 2. Heat 14 tablespoons butter in 10-inch skillet over medium-high heat until melted. Continue cooking, swirling pan constantly until butter is dark golden brown and has nutty aroma, 3-5 minutes. Remove skillet from heat and, using heatproof spatula, transfer browned butter to the bowl of sugar and stir to combine. Let this mixture cool slightly, 5 minutes or so, to avoid scrambling your eggs when you add them. 3. Once butter sugar mixture has cooled to the point that you can touch it briefly with your finger, add salt and vanilla to bowl with butter and sugar and whisk until fully incorporated. Add egg and yolk and whisk until mixture is smooth with no sugar lumps remaining, about 30 seconds. Let mixture stand for 3 minutes, then whish for 30 seconds. Repeat process of resting and whisking 2 more times until mixture is thick, smooth and shiny. 4. Using rubber spatula or wooden spoon, stir in flour mixture until just combined, about 1 minute. Stir in chocolate chipsand nuts (if using), giving dough final stir to ensure no flour pockets remain. 5. Put dough in the fridge for up to 3 days. Then allow the dough to come to nearly room temperature and divide dough either into 16 portions (for really big gigantic cookies) or into smaller portions if you prefer. I usually get about 30-32 cookies out of one batch which should tell you how big these cookies are if you are only making 16!! Place dough balls on a cookie sheet and freeze for 15 minutes. Once frozen enough to maintain their shape, put all cookie dough balls into a ziplock bag and label with the date. 6. When you want to bake your cookies. Preheat the oven to 375 degrees F or 190.5 C. Bake cookies 1 tray at a time until cookies are golden brown and still puffy, and edges have begun to set but centers are still soft, 10-12 minutes, rotating baking sheet halfway through baking. Transfer baking sheet to wire rack; cool cookies completely before serving. Thanks! I always appreciate a recipe that has been tested & tweaked with obvious care. Most surprising to me is that you mix this cookie dough by hand. Is that a personal preference, or do you think that it affects the final product? This dough is totally hand mixable because the butter is melted so there is no creaming of soft butter/sugar involved. In fact, the butter will still be so warm when you add it to the sugars that the sugars will start to melt into and dissolve a little bit, making it a very easy batter to stir. I think for this cookie, the texture comes from the extra egg yolk and the careful baking to the point of just-barely-done. Thanks for reading! I always have to freeze half the batter immediately – if I bake them all at once, the temptation to eat them all in one sitting is too much. I’ll have to try your recipe now! By the way I’ve been really enjoying your blog for the past few months, and this is my first comment. Keep up the great writing & photography! Life in India sounds fascinating. Oooh I do love oatmeal (I eat it every single morning for breakfast) this recipe sounds fantastic! Another one to try! And yes, the oven timing! I never show people the cookies I”m serving them right out of the oven as they would probably say they are undercooked. But after cooling for a few minutes and serving they always disappear quickly! Thank you for reading! Life here is fascinating and it’s fun to try and get to photograph and share it! Try it. You’ll love it : ) I meant to mention another of my tweaks for that recipe – I use about a cup and a half of of light brown sugar (Trader Joe’s calls it ‘evaporated cane juice’) which works perfect for me – not too sweet. oooh perfect, I love brown sugar instead of white-adds such a nice depth of flavor! Thank you so much again for the recommendation, can’t wait to try! We are peas in a pod Dani. I have a secret chocolate chip recipe that I love and it is saltier and calls for 1 Tbs of vanilla. I like the idea of adding a bit of almond-nice touch. My recipe is the melted butter sort so I think I might brown it this next week to see how that goes. Dark brown sugar and white are a nice combo. I also let my dough age! It sits in the freezer and ruminates an entire week. 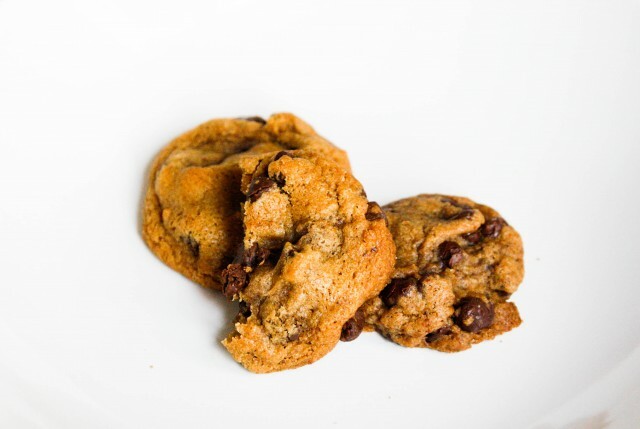 You really had me at crunchy on the outside and gooey in the middle…it’s how a chocolate chip cookie should be. Thanks for sharing your tweeks! I can’t wait to try it! haha I’ve thought more than once that, if we were at the same Post, the mail room wouldn’t know what to do with us–it would be all sorts of fun flour orders! 🙂 Melted butter is definitely the way to go I think. Because of the brown butter this cookie turns out really, really dark, it’s not a pretty cookie but it’s a tasty one! HA! All sorts of exotic extracts too. I’m waiting on almond, orange, coffee and lemon right now! I’m off to make cookies right now and I’m going to try my recipe but brown the butter this time to see how that changes things. How fun!!! hehehe just bought me some almond and vanilla extracts too—had to refrain from getting the orange and lemon. Where do you order from? I love KAF but I hate the shipping charges! Oh and my recipe calls for an extra yolk too! It does the trick! I’m bookmarking this recipe, and as soon as our UAB/HHE arrives I’m going to town. yay! When does your stuff arrive? Are you guys in a fast place?